Since I always love Nyko’s products for the Wii, I couldn’t wait to see what they had to show at CES 2009. I was not disappointed, even though their newest Wii accessory, the Wand, is quite similar to a product that already comes with the Wii. Hey now, there are a lot of differences between the Wand and the Wiimote. For starters, the Wand has a rubberized grip so it won’t slip out as easily, the 1 and 2 keys are enlarged, and look at that A button, it is red, baby! Okay, I know what you are thinking. 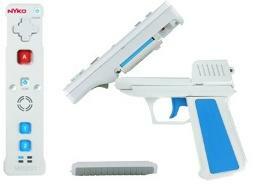 Uh…yeah, it’s still just a Wiimote, man. Well, it does have a built-in speaker, vibration function, and a 25 foot wireless range. Oh, who am I fooling, it really is just a…wait a minute, the Wand has Trans-Port technology. That means that there are some special connectors on the base that are not on the regular Wiimote. This allows the Wand to be put in a new kind of Pistol Grip, which is not yet in Nyko’s current catalog. This Pistol Grip is a first for guncase mods, because a second trigger on the back of the gun allows the player to use the A key and B key. The Wand won’t be available until sometime around March, but I’m not certain of the price. I would like to call Nyko’s new Wand as the Wiimote 2.0, but I’m sure that Nintendo would not allow it. Look Out Motion-control, here comes the Cywee!